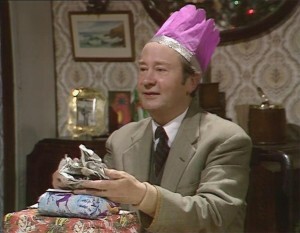 Bob: At last, a proper Christmas episode! No sleight of hand, no fake festivities at the height of summer, this is Summer Wine on Christmas Day… and it’s slightly incongruous seeing a wintry, tinsel-festooned Holmfirth. We’re so accustomed to that gentle, early autumnal feel. 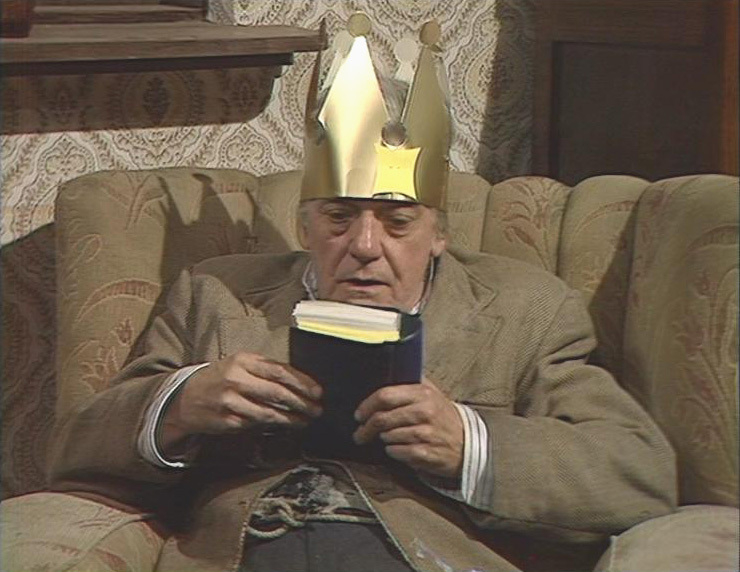 Mind you, I say Christmas Day… this was actually broadcast at 10.40pm on Boxing Day! Is that the latest timeslot the show has ever had? Surely it is! Andrew: Is it that time of year again already? Clegg seems to be wondering the same thing during this, our second festive offering from the series. His mild annoyance at how early Christmas rears its head and for how long it hangs around just goes to show that things never change. Every year I seem to do battle in the pub with someone whinging about the same thing, as though it were a new development. Bob: I’m sorry to keep banging on about how evocative these episodes are of my own childhood, but really… this just IS the Christmas Day of my very early childhood. Dark, deserted streets, teenage lads with flares and new skateboards, and a real air of resolute jollity amidst the all-pervading austerity. Just to put things in context, the winter of 1978/79 was James Callaghan’s ‘Winter of Discontent’, in which the country was brought almost to its knees by an epidemic of industrial action… binmen, train drivers, lorry drivers, even – famously – gravediggers went on strike, amidst the most ferocious snowfalls since 1962. It really was an extraordinarily bleak hour, and my memories of that Christmas are of threadbare tinsel and the cheapest of entertainments… my Gran raising a thimble glass of sherry in front of Larry Grayson’s Generation Game. And yet, weirdly, watching this, I want it back. All of it, in a big bundle of misty-eyed cosiness. Andrew: I know that this is just a bi-product of the show’s unseasonal production, but one thing I find really refreshing here is the complete lack of snow or references to it. I can’t think of another more accurate depiction of the typical British Christmas than the dull weather and quiet streets on display here. Every other Christmas television special seems to either have to import some of the white stuff or have the characters pining for it. And just as a side note, I think this is the first time anybody has mentioned the fact that cigarettes have all but vanished from the series since the grittier Blamire period. Clegg references the fact that he’s given them up in order to live longer. It certainly worked! Bob: It never snowed at Christmas in the 1970s! Good to see farce supremo Brian Rix in this… quite a big name for 1978, they’d pulled out all the stops. And the scene in Clegg’s house has a nice line in typical Summer Wine humbuggery. ‘Christmas comes but once a year,’ muses Clegg. ‘It just seems longer’. Meanwhile, Foggy is pondering the possibility of the Russians attacking on Christmas Day, when Britain’s defences are clearly off their guard. Yes, add impending nuclear apocalypse to your growing list of 1978 wondrousness! Compo, at least, finds room for some sentiment. ‘Christmas is magic when you’re a kid,’ he ponders. ‘Grown-ups never get any fun presents’. And, of course, he’s right. It’s only with the benefit of hindsight that I can put my childhood festivities into the context of such bleakness. At the time, aged six, it was simply the brightest, sparkliest day of the year – a riot of 75p Star Wars figures and, hey… I loved Larry Grayson. Still do. When the surely-inevitable Generation Game boxset finally earns a release, can we blog our way through that as well? Is anyone at Acorn DVD reading this?!?!? Andrew: As ever, our trio is left to their own devices. Alone for Christmas, they make do with each other’s company. It’s a bit sad, really, but Clarke doesn’t dwell upon it. Today, the idea of the disenfranchised elderly spending time alone over the holidays is, depressingly, more relevant than ever. And so, in order to alleviate the boredom, Foggy suggests they take a trip to the hospital to visit their ailing friend Edgar. 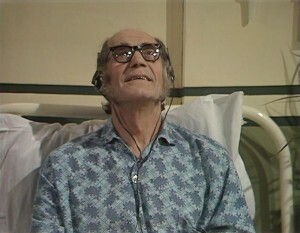 Edgar, however, is quite happy without visitors, given that ‘He has colour television and all the nurses he can eat ’. Meanwhile, Sid and Ivy and Nora and Wally provide a family-centric counterpoint to our trio’s lonely yuletide. Not that they are exactly thrilled about having the relatives around! Sid and Wally, in particular. Bob: Can I just keep harping drearily about 1970s Christmases, please? Matching jumpers! Cracking walnuts! 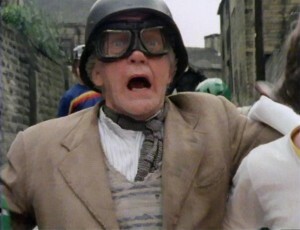 ‘Cousin Dudley, all the way from Garstang’! It’s perfect. Lovely scenes with Wally and Nora in the kitchen as well. Andrew: Wally comes out with one of my favourite lines so far, the Freudian slip, ‘Why don’t you go sit down, Nora? You’ve been on your mouth all day!’ It’s Sid and Ivy, however, who once again inject a bit of heart into the show. There’s a genuinely tender moment between the pair and a black nightie, with Ivy finally getting a taste of the kind of relationship she was pining for, back during her Series 3 trip to the seaside. Bob: Yes! Sid has, incredibly, bought Ivy a saucy black nightie for Christmas and she is, incredibly, utterly thrilled. Despite all appearances to the contrary, there are still little frissons of excitement to found in the darkest depths of that marriage. Andrew: Our climax sees Compo joining in with some skateboarding frolics. The must-have present of 1978 appears to have been a skateboard – at least it Roy Clarke’s mind. And it’s good to see kids using them for what they were meant for; none of this Tony Hawk rubbish, just bombing down hills at dangerously insane speeds. Look out for the Dodworth Colliery Band! Bob: The must-have present of Christmas 1978 was undoubtedly ANYTHING with a Star Wars logo on it! The film been rolled out across the country in early 1978, and British kids had gone mental for it. Skateboards were definitely pretty hot at the same time, though. Andrew: And, crucially, weren’t copyrighted up to the hilt! It isn’t long before we are witness to a head-on collision with the town’s brass band and I’m all for this kind of stunt. Compo’s turn of the board is not only perfectly in keeping with his character, but also totally fitted to the situation. Sydney Lotterby’s direction is superb during this sequence as well. He turns a minor kafuffle into a Hollywood style suspense sequence with careful cutting and well-orchestrated camera setups. Bob: I’m not as keen on the stunts as you, but yep – it’s nicely done. And indeed, it’s the Dodworth Colliery Brass Band marching cheerily through the freezing streets. They’re still going strong if you want to book them? Maybe we should get them to play at the after-blog party when we’ve finally finished this insane quest, sometime in early 2045. Andrew: I’m working on it…. All in all, I think this episode really justifies ‘special’ label. Bob: Did I miss something here, though? What’s the title all about, the ‘small tune on a penny wassail’? Is it mentioned anywhere? I too love Wally’s “You’ve been on your mouth all day” line, in fact the scenes of each couple in the kitchen are lovely moments. I notice the chap Clegg rings from a public call box (!) is Mouse from “A Quiet Drink” (were there really that few actors in Yorkshire at the time?). It’s also amusing that Edgar is the postman from the previous Christmas special. The present giving scene is a treat, with Clegg and Foggy being on the same wavelength, whilst Clegg’s “fish and chips twice” line gives way to the dated joy of digital watches (and subsequent pratfalls about skateboards). The vignettes with Ivy & Sid, and Nora & Wally, provide notable contrasts to our heroes’ sober reflections. The line about Nora’s family coming from Garstang always strikes a chord since I lived there for many years, and it’s all too believable. It really IS a special.